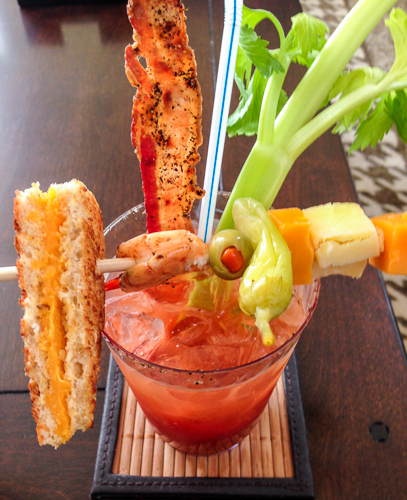 It's no secret that I adore the spicy, mouth-tingling sensation of a Vintage Vine bloody mary. So for Super Bowl Sunday, I decided to go big or go home with a massive one gallon growler of Vintage Vine Spicy Bloody Mary Mix. My bloody mary bar contained all the usual fixings: celery, citrus, olives, pepperoncini, a variety of hot sauces and two types of cheddar cheese cubes. For some added flavor and pizazz, glasses were adorned with a nice spiced rim salt courtesy of Demitri's RimShot . And Old Bay Shrimp, Pink Peppercorn Bacon and mini grilled cheese sandwiches provided the final garnish touch.